Book Review « How Do You Measure 525600 Minutes? I don’t make it a habit to review a lot of books for my blog. When I do, there has to be something truly special about them than make me feel compelled to share. I am by no means what I would consider a professional book critic. I just love to read. Growing up, we didn’t live in traditional neighborhoods where we had access to a lot of friends. Quite often, books were our only friends, especially during the summer. My sister and I would beg our parents to take us to the library. Both of us often checked out the maximum of twenty books at a time, only to have read them all in a few short days and then we’d be begging to go back for more. This pattern went on into high school, when suddenly school and social lives had us putting books on the back burner. At some unfortunate point later in life, I nearly stopped reading (for pleasure) altogether. Occasionally, I’d find myself in the mood again, or I’d have that vacation book to read on the plane or by the pool; but for the most part, I’d stopped reading altogether. I’d always meant to start reading again, finish a book or two; and then find life as an easy excuse not to continue. Earlier this year, I found myself out of excuses and accepted a challenge on the Goodreads website, committing myself to read twenty books this year. I believe that was back in March. Here it is now, August, and I’ve just finished reading my sixtieth book with no signs of stopping. A good book takes you on a journey, unlocks your imagination and can empower your passion and desires. I just finished reading the second of my two favorite books this year. Shortly after I started, I knew I wanted to review these two books together because they both had so much in common. In both cases the authors were young men… searching. Both searching for paradise of sorts; one in the form of the perfect pizza slice and the other in a deserted island. As a result, both happily found much more than either had bargained for. New York and Pizza. Two things very dear to my heart. That’s all it took to draw me into this book. I try not to have too many expectations when I start reading but I’ll say I fully expected this to be more of a run down on pizza in NYC– more review based. Pleasantly, I discovered I was wrong. Slice Harvester is so much more. It’s part memoir, part history, part pizza critic…. mostly it’s a completely honest telling of one man’s unique journey to find his true self in one of the most amazing cities in the world. While there are some short, mostly amusing tidbits of Hagendorf’s pizza reviews in the book, that’s only part of the whole. You can read all his critiques in their original blog form on his Slice Harvester site. I ended up spending hours there reading, after I finished this book– comparing opinions on places I’ve already tried and making notes on pizza I have to try on my next visit to New York. This book isn’t a cheese slice– it’s an everything-and-more slice. All the ingredients are here in perfect amounts for a beautifully balanced, delicious read. I absolutely love this book. 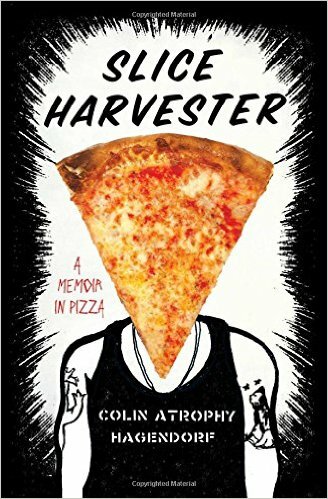 Over the course of two years, a twenty-something punk rocker eats a cheese slice from every pizzeria in New York City, gets sober, falls in love, and starts a blog that captures headlines around the world—he is the Slice Harvester, and this is his story. Since its arrival on US shores in 1905, pizza has risen from an obscure ethnic food to an iconic symbol of American culture. It has visited us in our dorm rooms and apartments, sometimes before we’d even unpacked or painted. It has nourished us during our jobs, consoled us during break-ups, and celebrated our triumphs right alongside us. In August 2009, Colin Hagendorf set out to review every regular slice of pizza in Manhattan, and his blog, Slice Harvester, was born. Two years and nearly 400 slices later, he’d been featured in TheWall Street Journal, the Daily News (New York), and on radio shows all over the country. Suddenly, this self-proclaimed punk who was barely making a living doing burrito delivery and selling handmade zines had a following. But at the same time Colin was stepping up his game for the masses (grabbing slices with Phoebe Cates and her teenage daughter, reviewing kosher pizza so you don’t have to), his personal life was falling apart. A problem drinker and chronic bad boyfriend, he started out using the blog as a way to escape—the hangovers, the midnight arguments, the hangovers again—until finally realizing that by taking steps to reach a goal day by day, he’d actually put himself in a place to finally take control of his life for good. Pacific Paradise. This book sparked my interest because Michael and I are visiting the Pacific region later this year. I thought this book might give me some insight, or at least a point of reference on our trip. 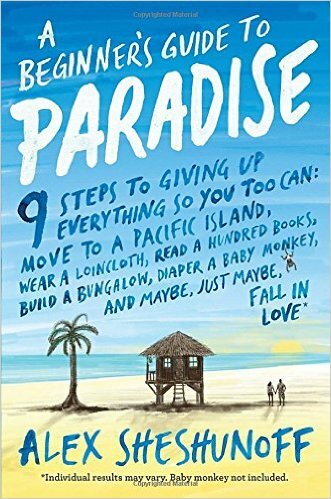 Who hasn’t dreamed of giving up everything to live on a deserted island at some point in their life? Many of us long for, if not only the idea of Paradise. As Alex Sheshunoff discovered and shares in his book, the search for Paradise may just turn out to be something entirely different than you’d expect. You may end up with much more than you bargained for; good and bad. I loved so many aspects of this book. Like Hagendorf, Sheshunoff tells the story of his personal journey, honestly and unashamed. He also shares much of the history and traditions of the islands, taking readers on a full descriptive and visual journey in counterpoint to his personal one. It’s a beautiful story of life, love and exotic locales. In the end, he discovers that true paradise is in the heart. 1. How much, per pound, should you expect to pay a priest to fly you to the outer islands of Yap? 2. Classic slumber party stumper: If you could have just one movie on a remote Pacific island, what would it definitely not be? 3. How do you blend fruity drinks without a blender? From Robinson Crusoe to Survivor, Gilligan’s Island to The Beach, people have fantasized about living on a remote tropical island. But when facing a quarter-life crisis, plucky desk slave Alex Sheshunoff actually did it. While out in Paradise, he learned a lot. About how to make big choices and big changes. About the less-than-idyllic parts of paradise. About tying a loincloth without exposing the tender bits. Now, Alex shares his incredible story and pretty-hard-won wisdom in a book that will surprise you, make you laugh, take you to such unforgettable islands as Yap and Pig, and perhaps inspire your own move to an island with only two letters in its name. Answers: 1) $1.14 2) Gas Attack Training Made Simple 3) Crimp a fork in half and insert middle into power drill 4) No. Harvesting Paradise. It was a complete coincidence that I read these two books so close together. Both reaffirm the life journeys we all make– our passion and desire to find happiness and paradise; whether it be on a deserted island or in an urban jungle. Paradise is within all of our reach. We can search the world and never find it. Harvesting the best of life and finding our own personal paradise can’t begin until we start the very personal journey of exploring within. Both of these authors found it, so can we. I was very fortunate to receive advanced reading copies of both of these wonderful books from the publishers through NetGalley. 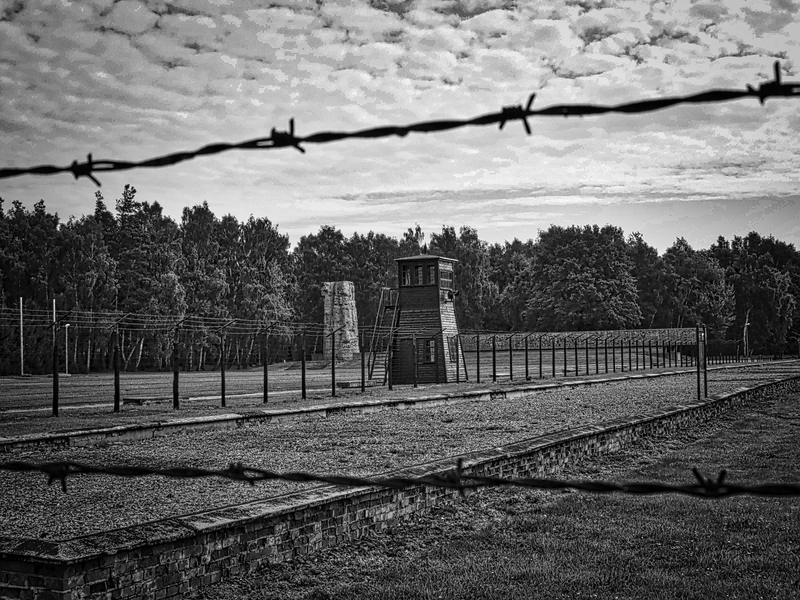 In August 2013, I visited Berlin and the Museum Stutthof (Stutthof Concentration Camp) near Gdansk in Poland. For me, it was an emotional journey in remembrance of horrible atrocities that occurred in the world, long before I was born. As I started reading the novel, The Children’s Train, I had images come to life, enhanced by places I had visited. I thought I’d share some of the pictures I took, along with my review of Jana Zinser’s captivating new book. 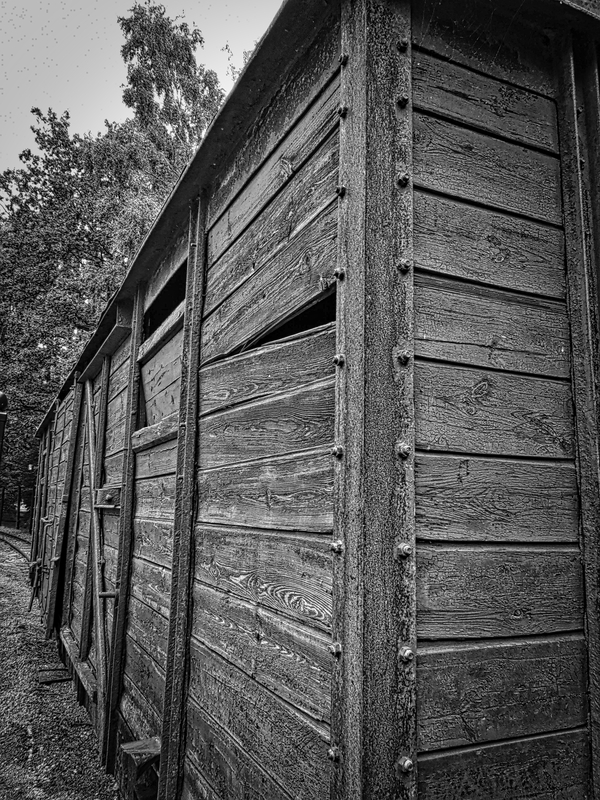 The train gate at Museum Stutthof, Poland, where prisoners where brought into the camp. August 2013. It has been estimated that from 1938 to 1940, the Kindertransport spared the lives of 10,000 children from almost certain death at the hands of the Nazis. Most of those children, from infant to age 17, were the only members of their families to survive the brutality of World War II. Parents desperate to protect their children, handed them over to strangers to be boarded on trains that would take them to safety. This is the beginning premise of Jana Zinser’s fictional, The Children’s Train, A Novel to be released by BQB Publishing on October 26, 2015. Zinser has written a heart-wrenching, epic story that follows lives of several children that survived (as well as the fates of their families); from the beginning occupation through the end of the war. Zinser takes readers from escape of occupied territories, into hiding, to safety, the concentration camps; and then back undercover behind enemy lines. In November 1938 on The Night of the Broken Glass, the Jewish people of Germany are terrified as Hitler’s men shatter their store windows, steal and destroy their belongings, and arrest many Jewish fathers and brothers. Parents fear for their own lives but their focus is on protecting their children. 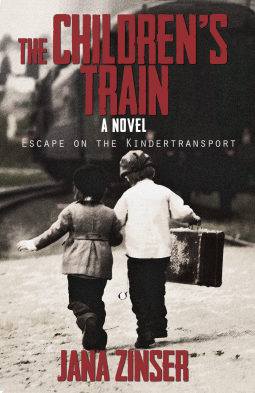 When England arranges to take the children out of Germany by train, the Kindertransport is organized and parents scramble to get places on the trains for their young family members, worried about what the future will hold. Soon, trains filled with Jewish children escaping the Nazis chug over the border into Holland, where they are ferried across the English Channel to England and to freedom. But for Peter, the shy violin player, his sister Becca, and his friends Stephen and Hans, life in England holds challenges as well. Peter’s friend Eva, who did not get a seat on the Kindertransport, is left to the evil plans of Hitler. Peter, working his musician’s hands raw at a farm in Coventry, wonders if they should have stayed and fought back instead of escaping. When the Coventry farm is bombed and Nazis have reached England, Peter feels he has nothing left. He decides it’s time to stand and fight Hitler. Peter returns to Germany to join the Jewish underground resistance, search for the mother and sister he left behind in Berlin, and rescue his childhood friend Eva. It’s a story of fear, torture, loss, hope, freedom, survival and most important of all– it’s a story of heroism of epic proportions. 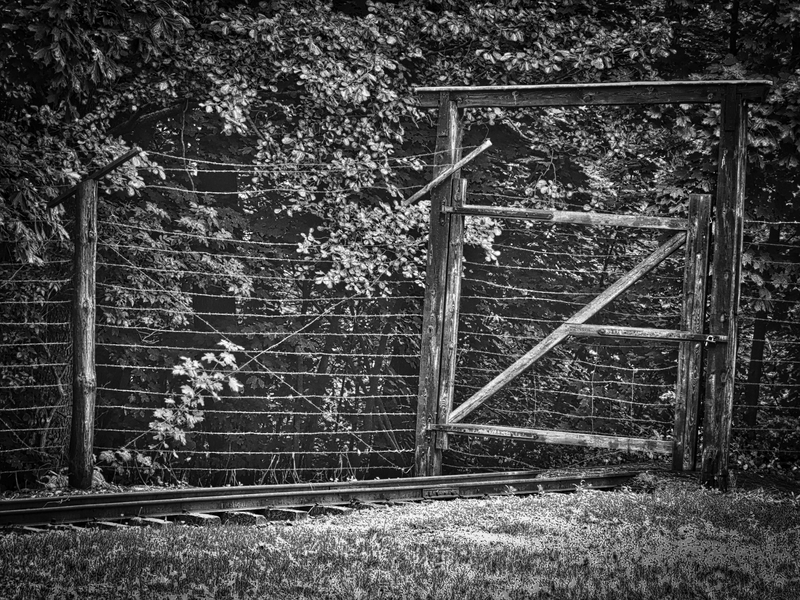 As someone that has had an ongoing interest in Holocaust studies and education, what I really like about The Children’s Train is that this novel gives the reader an in depth look; both in varying viewpoints and through a broad scope of experiences, making it a perfect introductory-look into the history of the Holocaust. It is thoroughly engaging from start to finish. After reading, you not only have a better picture of the many devastating situations endured by Holocaust victims and survivors; you also have a clearer understanding of Nazi and German (not mutually inclusive) people’s positions and actions. Yes, some believed in Hitler’s plan of hate. Others acted based on financial reasoning and many more out of fear. The subject matter may be a little heavy for young readers but I’d certainly recommend it for high school through adults. Zinser tells the story simply, without over-dramatizing or trying to be graphically-shocking. By the very nature of the events, even through the author’s delicate handling, it might be too overwhelming for younger children. The young lives of Peter, Eva and all the others will tug at your heart and inspire you. You’ll discover hope in humanity though quiet, unassuming acts of courage and heroism; and mourn the lives of those that were lost. Though 10,000 children may have been spared by the Kindertransport; 6 million Jews lost their lives at the hands of the Nazis — many of them children. This is their unforgettable story. I received an ARC of The Children’s Train, A Novel through NetGalley. When I woke up this morning, taking my cup of coffee and Kindle outside, I had hoped to spend a few quiet few hours reading before Michael and the kids (our pups) got up. I didn’t expect to finish, teary-eyed and even bawling through passages of the final few chapters. A good book, whether fiction or non, takes you on a journey. Perhaps somewhere familiar or on some new adventure. If you’re lucky, besides a good read, you might learn something along the way. I got a complimentary ARC (Advanced Reader Copy) of All Dogs Go To Kevin by Dr. Jessica Vogelsang through the NetGalley website. It’s official publication date is July 14, 2015. As a dog owner/lover, I thought I’d give it a shot. 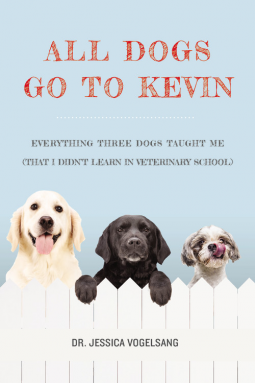 The brief description from the publisher: ALL DOGS GO TO KEVIN is a humorous and touching portrait of a veterinarian, her beloved dogs, and the lessons they impart to her along the way. This isn’t an owners’ manual or a how to book, but rather a beautiful memoir of sorts, of Doctor Vogelsang’s (Dr. V) personal journey to becoming a caring Veterinarian, mother and guardian of some wonderful dogs. There are some wonderful takeaways in this book that are inherently present. 1) All dogs are not created equal. 2) All vets are not created equal; and there is an important partnership between owner and caregiver that should be present to maximize a pet’s quality of life. 3) The pain and heartbreak of losing a pet can never outweigh the rewards of loving one. A year and a half later, I’m still grieving the loss of Roxie. Not an all-consumed, depressing loss– but a day doesn’t go by that I don’t think or her and miss her wet kisses. And more so, I worry about her brother Cash; who at 12 years old, has good days and bad days and many in between. It was impossible not to directly connect with many of the humorous and touching moments of Dr. V’s experiences. Her empathy and humanity will enrapt you in an enormous bear hug and not let you go. So why the title, All Dogs Go To Kevin? I don’t like spoilers, so you’ll just have to read the book to find out. I highly recommend this book to pet owners, pet lovers and anyone even considering adding a furry friend to their family. It will serve as a great comfort and resource when building a life with a four-legged companion. Available in Hardcover, Kindle, Audible and Audio CD. Purchase on Amazon by clicking here.